I had dinner at Thai Thani in Celebration. Located in a space which was once one of the last few holdouts of Gooding's Supermarkets, Thai Thani has no resemblance to once being a food store. The restaurant was about half full when I ate there, yet all the servers were acting flustered and apologizing about how overwhelmed they were. It was strange to see all the servers act like this, when in all actuality, the service was fine besides all the apologizing. 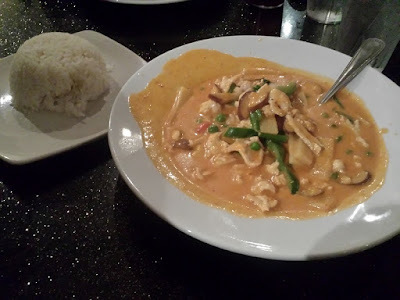 I had the Chicken Red Curry. This was a coconut milk based curry with string beans, eggplant, basil, bell peppers, peas, and bamboo shoots. Steamed rice was served on the side. It was pretty standard for a Thai restaurant curry dish, which is good. Only complaint was that I ordered the dish with medium spice and it had no heat at all. Still tasty though. I'd eat here again. I had dinner at a restaurant near Orlando International Airport called Fish on Fire. I went here with a a few people from a convention I was attending at a hotel a few doors down. If I was alone, I probably would have walked out because the whole place had the unpleasant stench of cigarette smoke. Nobody was smoking in the restaurant because that's illegal, but the large open doors leading to the patio brought the smell straight into the dining room. 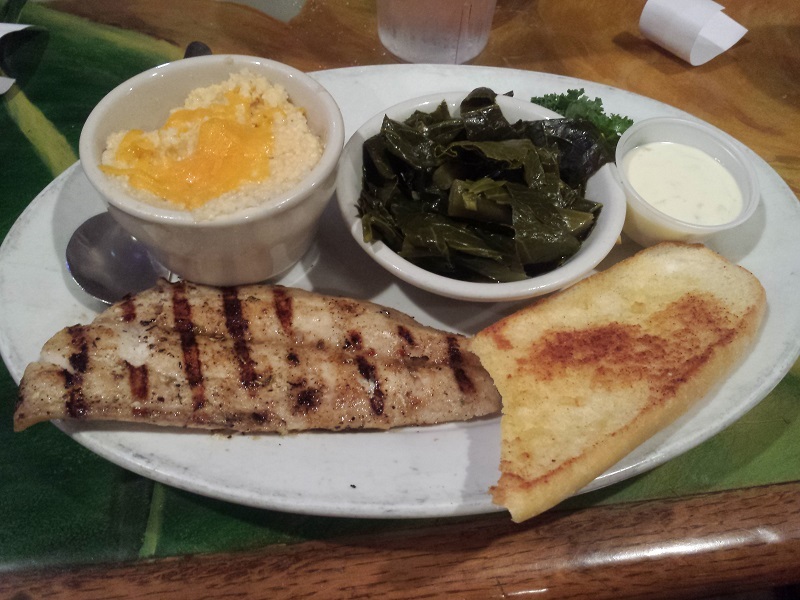 I ordered the Cobia for my meal. The fillet of fish was cooked well, with a nice bit of flavored seasoning. I had a side of collards which were good. My side of grits weren't so good. They were dry and crunchy. Our server seemed angry throughout the meal, but his service was okay until we were ready for the check. It took a good 45 minutes after we were done eating before we saw the bill. This was while asking our server repeatedly, then asking other employees who referred us back to our server. The fish was good, but Fish on Fire had too much going against them. I don't think I'd return. I was invited to try a new restaurant in Kissimmee called MidiCi. Located in a shopping center near the intersection of Osceola Parkway and 441, MidiCi is a quick service style restaurant. Neapolitan pizza seems to be the star here, with the entire kitchen centered around a wood-fired oven. You can either choose to order of the menu, or customize your pizzas by selecting what you want on your pizzas. I wanted to leave the flavor combinations to the experts, so everything I tried came straight off the menu. Burrata with Melon & Prosciutto di San Daniele: Fresh soft burrata cheese, fresh melon, prosciutto di San Daniele (imported from Italy and aged 24 months). The Devil's Pizza: Crushed Italian peeled tomatoes (sauce), fresh whole mozzarella, housemade all natural spicy sausage, spicy Italian salami (calabrese), all natural Fresno chilis, all natural Italian chilis, parmigiano-reggiano, organic non-gmo extra virgin olive oil, and fresh organic sweet basil. The pizza had a fair amount of spice for what is essentially a fast food restaurant. Pizza Bianca e Prosciutto: Fresh whole mozzarella, oregano, fresh garlic, parmigiano-reggiano, organic non-gmo extra virgin olive oil, topped with prosciutto di San Daniele and baby arugula after bake. Of the two pizzas I sampled, this was my favorite. Nutella Calzone with Fresh Berries: Our signature Neapolitan dough, light, thin, soft and chewy, baked fresh with Nutella, blackberries, raspberries, blueberries, and strawberries. Topped with a hint of balsamic reduction and shaved coconut. I've had similar desserts at other fast food Italian chains. This was better. The Drowning Gelato (Affogato): Italian vanilla gelato by Italian Master Gelatiers Leo Leo Gelato, drowning in espresso. I'm not a big coffee person so the espresso flavor was a bit strong for my liking. Everything I tried at MidiCi was delicious. The pizzas were done really nicely. All the appetizers and desserts were quality. I look forward to returning to MidiCi in the future!